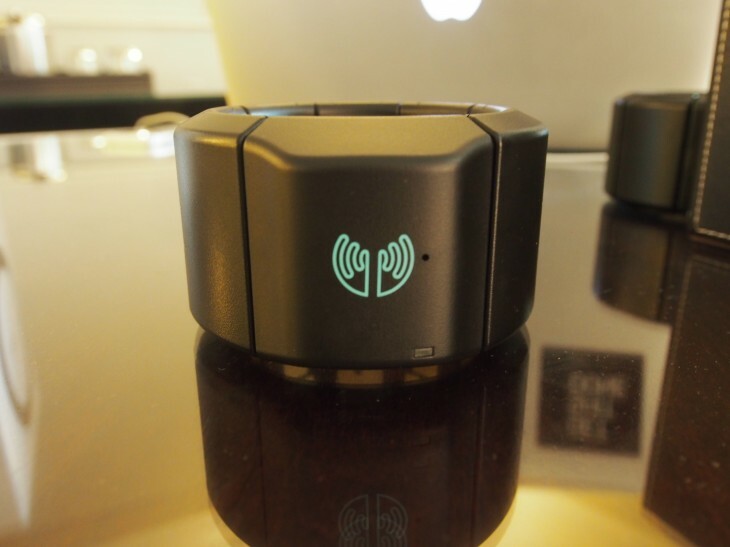 The last time we caught up with Thalmic Labs, the guys behind the MYO gesture control armband, the team was just beginning to ship Alpha editions of the device late last year. As gesture control continues to gain momentum with the likes of the Leap Motion, we sat down with the MYO’s creators to see how their device differs from the likes of the Leap and Microsoft Kinect. Unlike most gesture control machines that use camera sensors to detect motion, the MYO goes straight for the forearm to read the user’s muscle movements. Using a variety of accelerometer, gyroscopes, and magnetometer, the MYO can detect detailed data about your arm’s muscle activity, down to the tension level. This allows the bracelet to tell whether you are clenching a fist, flicking your wrist, swaying side to side, or a combination of the aforementioned. 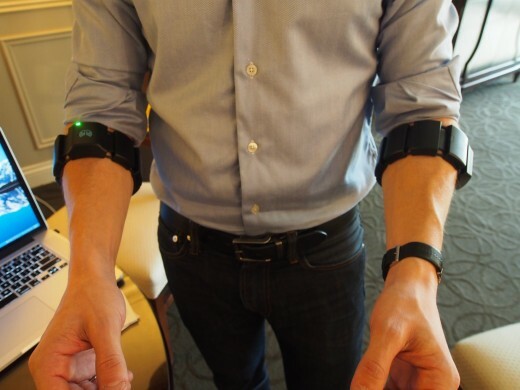 In a demo using two armbands to play Call of Duty, Thalmic Labs co-founder Aaron Grant programmed the armband to differentiate between left and right arm, and which specific movements determine the in-game character’s action. For example, clenching a fist in the right hand can pull the game’s gun trigger, while clenching the left hand’s fist makes the character crouch. Expanding the right hand can also halt the armband from activation, for when the wearer wants to take a break. From what we saw in the demo, the responsiveness was incredible. You don’t need to strain your arm clenching a fist for the MYO to recognize what was happening. Since the MYO are strapped to the user’s arms, the game can be controlled from any part of the room. No standing in front of a camera peripheral, no hovering your arms in front of you. You can even play the game with the arms down by your side if you want. Other use cases for the MYO include entertainment controls, such as turning your fist like a knob to control music volume or swiping hands left and right to rewind or fast forward content. Similarly, the gestures can be used in enterprise settings such as PowerPoint presentations or class lectures. When the MYO isn’t in use, it enters sleep mode to help conserve battery. “Power buttons are intentionally left out of the design to make this all about gesture recognition,” Grant says. Battery life is estimated at two days with constant usage, and the device charges via a USB wire. There’s definitely a small learning curve in getting accustomed to how quickly to move your arms to get the functions going. This can be adjusted with sensitivity settings, or with Thalmic Labs’ MYO app to help users practice arm controls. The data gathered from this app also help the team learn more about how users are interacting with the armband to finalize the consumer edition. Although the consumer version won’t hit the market until around Q2 of 2014, Grant says to expect the final device to look completely different from this Alpha edition. “The consumer version will be significantly thinner,” he says. Thalmic Labs is currently accepting pre-orders for the MYO at $149 per armband. To keep up with our CES coverage, check out our 2014CES tag.